Mission: To promote the appreciation of wildlife and increase harmony between humanity and nature. 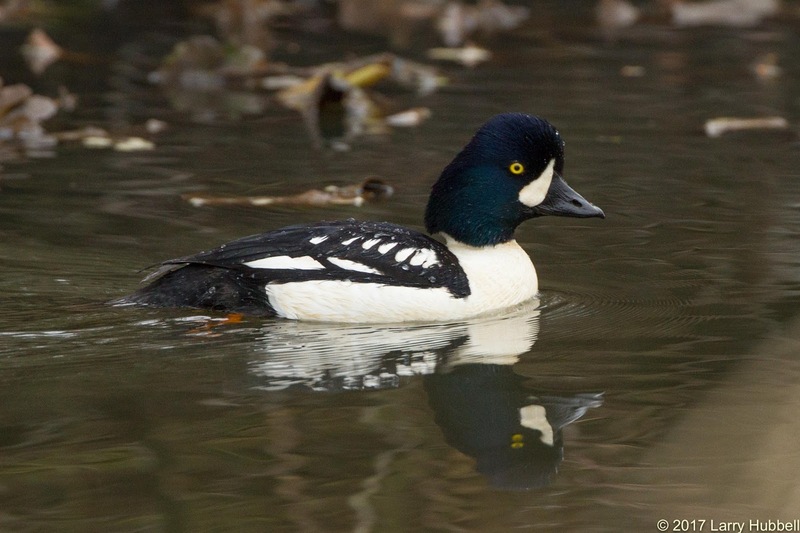 This exquisite duck is a male Common Goldeneye. I suspect he is practicing some aspect of his Spring mating ritual. 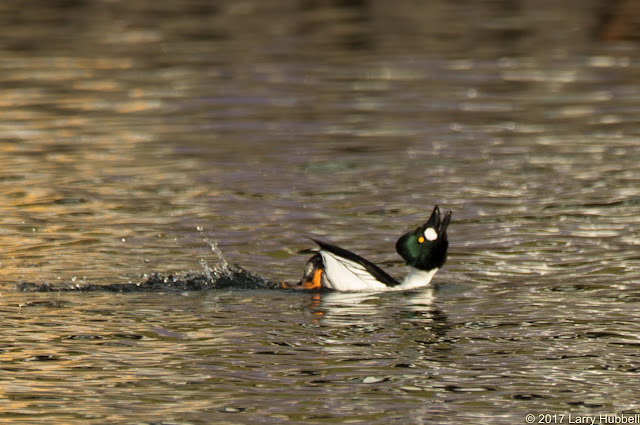 This photo was taken at the west end of the Montlake Cut, where I have been consistently seeing goldeneyes, during the last week. This is a female, Common Merganser. Every winter a few dozen of her species, settle in around the east end of Montlake Cut. The Cut, the man-made exit to the Lake Washington watershed, functions as a bottle-neck which concentrates migrating fish. 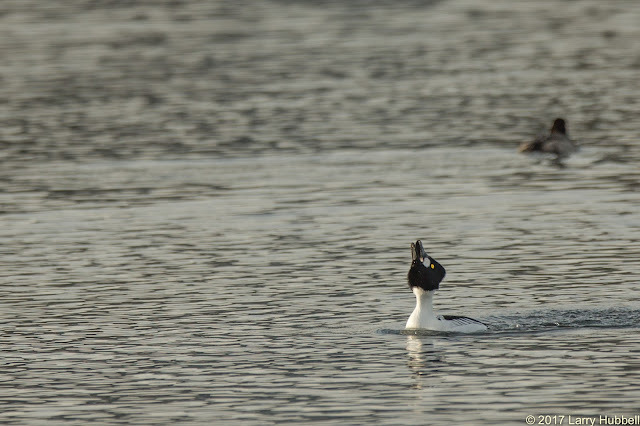 Its shallow, uniformly clear bottom also helps to make the area an irresistible hunting site for diving ducks, like mergansers and goldeneyes. One way to help improve the survival of salmon (and potentially Orcas) might be to build a narrow shelf along the south side of The Cut, in a manner similar to the Elliot Bay Seawall. Hopefully, it would provide essential shelter for young salmon heading out to sea. In the deciduous trees, on the north and south sides of Montlake Cut, I have been watching Common Redpolls. Poll is defined as head. The term redpoll is simply a subtle way of saying, redhead. This week I was suddenly struck by the coincidence that all three of these species are described by the word, common. I believe names in particular, and language in general, are critical to our learning and thinking processes. At a minimum, I think a name should provide us with critical distinguishing information about a creature, or a place. The term redpoll is good, but redhead would be more explicit. ...even though their eyes can be hard to distinguish without binoculars. 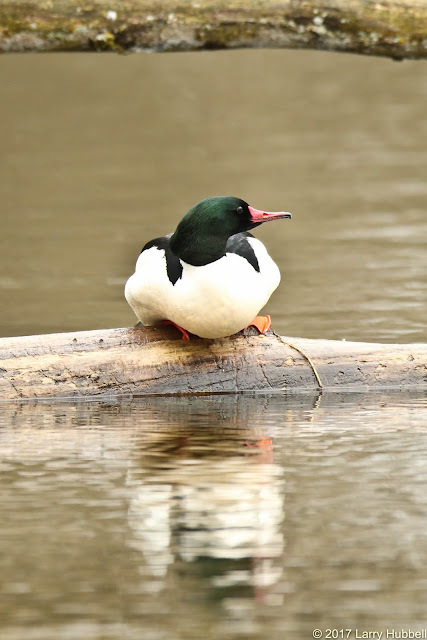 The term merganser relates to the Latin word, mergus, which means diver. Which is conceptually wonderful. However, given that Latin is no longer a commonly spoken language, it is slightly obscure. 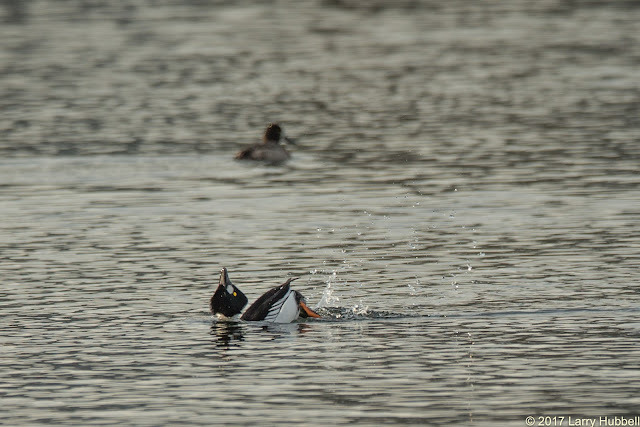 Of the three local mergansers, the Common Merganser has the largest bill. Changing this species' name to a Large-billed Merganser seems like it would be an improvement. 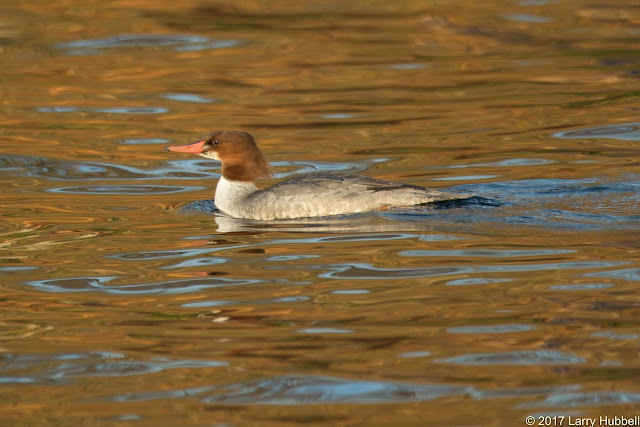 A previously used name for a merganser is, Sawtooth. This term describes the bird's serrated bill. 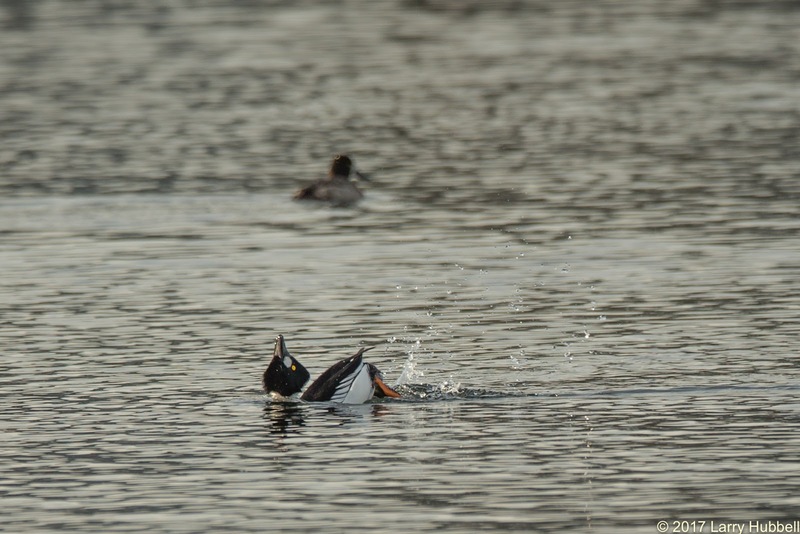 The serrations help mergansers to secure the slippery fish, which sustain them. 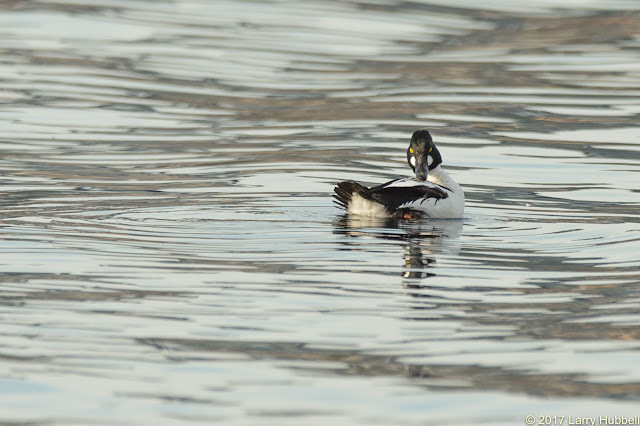 Similarly, Common Goldeneyes were sometimes called, Whistlers. 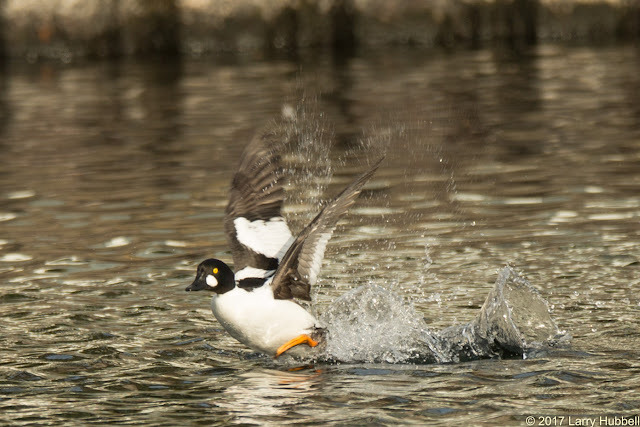 This name is due to the fact that their wings produce a whistling sound in flight. It seems to me the word 'common' is a total waste. It provides no value in helping to describe any species. I believe it may actually damage our perception of these complex and amazing lifeforms. For example, when we refer to people as commoners we imply that they are of a lower rank, not particularly unique and possibly even of lessor value. Describing any life form as common tells us more about our limited perceptions and lack of creativity, than it does about the creatures which we are attempting to name. This is an old photo of our other goldeneye, a Barrow's Goldeneye. 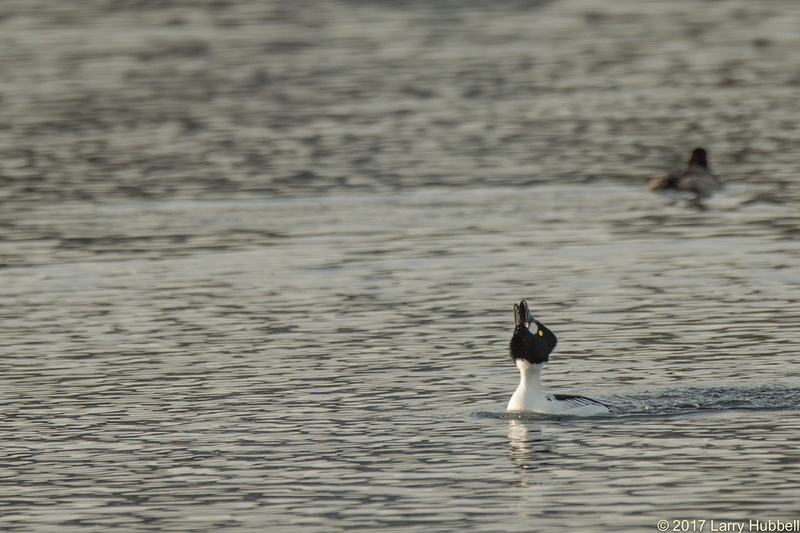 Noting the fairly large sequence of white markings on its back, this species might be better described as a Ladder-backed Goldeneye. Potential new names for the Common Goldeneyes, which would help to distinguish the two species, could be a Black-backed Goldeneye or a White-shouldered Goldeneye. Another set of options, would be to name them based on their unique white facial markings. In both cases these new naming conventions might create a perception of gender bias, since they only apply to the males. 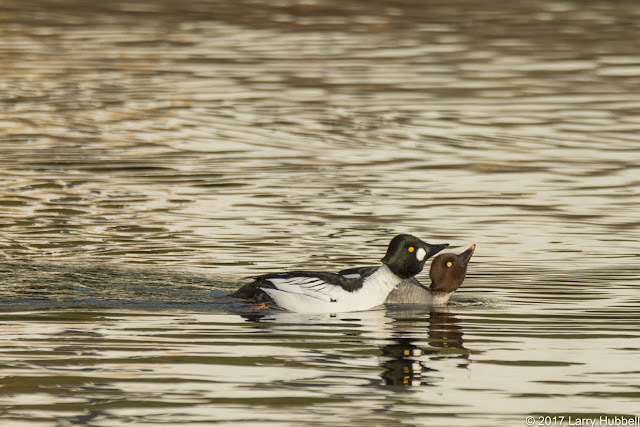 Given that the females of the two species are very similar, I have been unable to conceive of useful names which distinguish the two species, while also helping to identify both the male and female within each species. 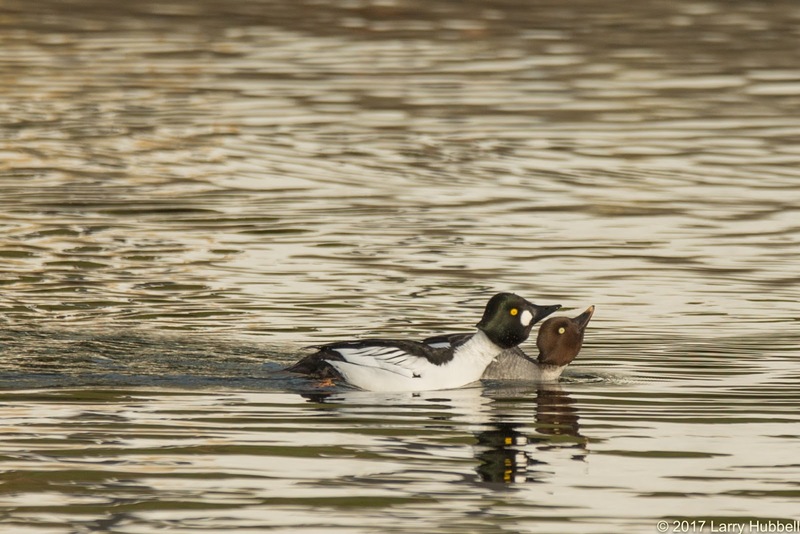 Hear is a photo of a male and a female Common Goldeneye. If you would like to provide an even better set of goldeneye names, without any perception of gender bias, hopefully this photo may help your creativity. Also, the yellow links in this post will take you to All About Birds, where you can find even more goldeneye photos. By augmenting our perceptions, using telescopes and space probes, we have expanded our knowledge and should by now realize that the diverse forms of life on earth only seemed common because of our own limitations. Our probes have now traveled more than a hundred million miles and no where else in our solar system have we found similar lifeforms. We have spent millions of dollars scanning deep space hoping for signs of intelligent life - without any luck. All life on earth, and especially the wild creatures, are obviously unique, precious and rare, and becoming even more so. If we are to evolve into a harmonious society, we must change the way we think about and treat our fellow creatures. Changing the way we describe other lifeforms seems like a logical place to start. No name will ever perfectly describe the complete beauty and complexity of any creature. Our goal should be refinement and improvement. We want to enable future generations to learn quickly and easily. I honestly believe a flourishing future for humanity may, at least in part, depend on how quickly our progeny are able to learn, know and care about their fellow lifeforms. This panoramic shot shows the new 520 pedestrian and bike path. You can see the path on both sides of this 180 degree photo. I took the photo last week on the first day that the new trail opened. It certainly provides a beautiful and interesting perspective on Union Bay. On the left is Marsh Island while Foster Island is on the right. The new path also reminds me of another language issue. Have a great day - walking around Union Bay! Without a well-funded Environmental Protection Agency, it falls to each of us to be ever more vigilant in protecting our local environments. Native plants and trees encourage the largest diversity of lifeforms because of their long intertwined history with local, native creatures. I have been told that even the microbes in the soil are native to each local landscape. My hope is that we can inspire ourselves, our neighbors and local businesses to plant native flora and to support native wildlife at every opportunity. My intention is to include at least one photo each week and visually challenge us to know the difference between native and non-native lifeforms. 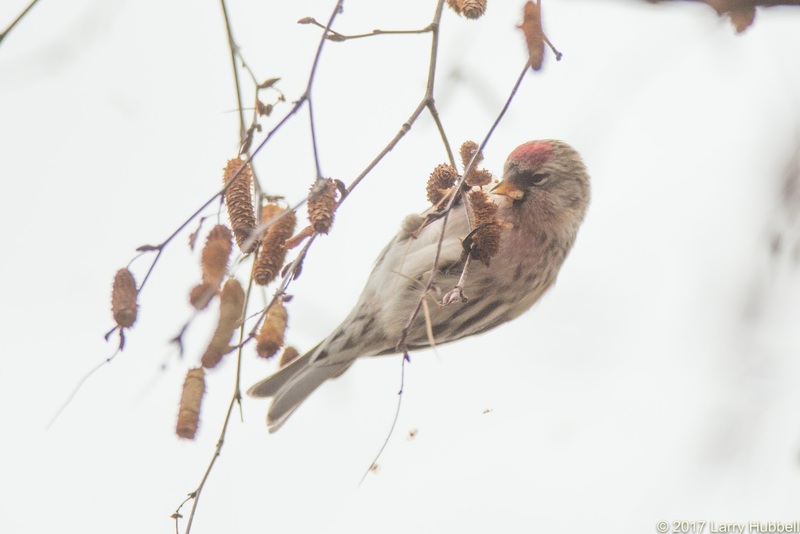 Is this Common Redpoll, and its tree of choice, native to Union Bay? The Common Redpoll is considered a winter native to Union Bay by some sources and not by others. My go-to source on the subject is Birdweb from Seattle Audubon. It says the Common Redpoll is 'irregular' around Puget Sound, primarily in the winter. Irregular is defined as being even less frequent than 'rare'. Given this, I personally do not consider a Common Redpoll a Union Bay native. All sources seem to agree that Common Redpolls breed primarily in the Arctic. I believe the tree in question is a European Birch, although without leaves to study I am not positive. I found it on the east end of Shelby Street, just south of Montlake Cut. In any case, I remember Dennis Paulson telling me that, historically, our native paper birch trees did not exist south of Everett. As a result, it is my belief that the tree in question is not native to Union Bay - even if it happens to be a native North American Birch. 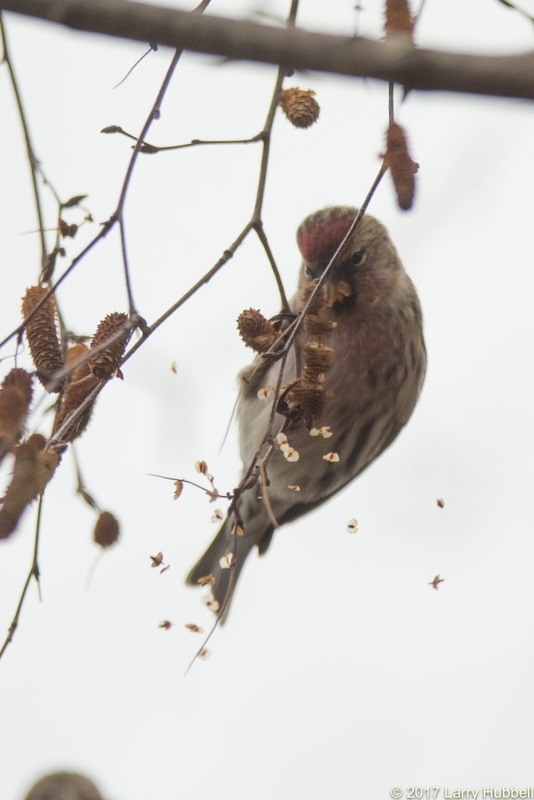 While standing under the tree to take the photo the flock of Redpolls fed so aggressively that the tiny seeds fell like snowflakes. When I got home my hat and backpack were still completely covered. Over the years I have had many readers tell me that Google is no longer sending them email announcements regarding my posts. Even more frustrating when they go to 're-sign-up', hoping that will enable them to once again start receiving the announcements, they get a message which says 'Sorry, you are already signed up.' Google has not responded to my requests for help with this issue. My functional work around is to setup my own email list and each week I manually send out a new post announcement. If you are experiencing the issue and would like to be added to my personal email list please send me an email requesting to be added. Thank you for your patience! The etymology of the word common means "c. 1300, "belonging to all, general," from Old French comun "common, general, free, open, public" (9c., Modern French commun), from Latin communis "in common, public, shared by all or many; general, not specific; familiar, not pretentious," from PIE *ko-moin-i- "held in common," compound adjective formed from *ko- "together" + *moi-n-, suffixed form of root *mei- (1) "to change, go, move," hence literally "shared by all." So perhaps not such a negative connotation if you think of the word in terms of "community". Thank you for your thoughts! That is an interesting idea. I did not think of considering the etymology of the word common. I appreciate your bringing up the positive connotations. I did feel like this was one of my more opinionated posts, so it is good to hear another perspective. None the less, I do think we can do better when it comes to selecting bird names. Thanks again! Please enter your email address to receive my weekly posts. __Where in the world is Union Bay? The other day my daughter asked, "Why birds?" Many thoughts came to mind but I realized that my reply required some history. Before my daughter was born I began collecting ideas and thoughts about how to make our world a better place. This collection eventually became a website called Utopianworld.org. That work led me to believe in four values: Children First, Accountability, Learning to Live and Living Lightly. Over time I realized this text-based site was not having the desired impact and a more visual message was needed. Eventually I retired the site, started taking art classes and began working to improve my photography. 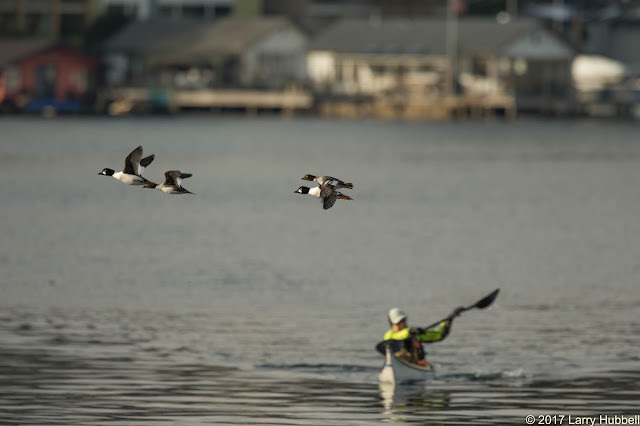 I find birds compelling, beautiful and symbolic of our impact on the natural world. To me they represent the life forms and ecosystems that are disappearing as humanity expands. My fear is that our progeny may forever live in a diminished world of crows, concrete and mechanical devices. I hope my focus on birds reminds us of what we need to save.